Departing from our shop in Discesa dei Giudici 21, in the quiet and beautiful pedestrian area, we’ll discover the architecturally-impressive Piazza Bellini e Piazza Pretoria, with outstanding examples of Arabic, Norman, Byzantine and Spanish art. 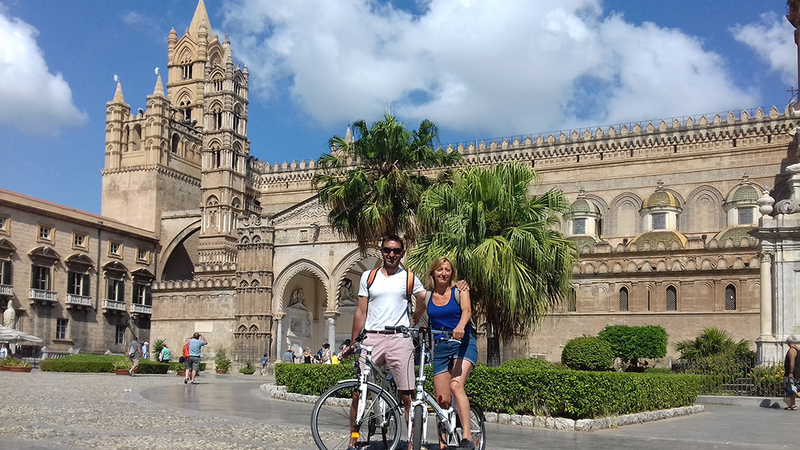 Then we’ll ride across the main ancient “Cassaro” street, visiting the outstanding square of San Francesco, the impressive “Piazza Marina” with its giant ficus trees and the massif “Steri palace” that once housed the Spanish Inquisition. We’ll gain the charming tourist port of the “Cala” and then the spectacular expanse of greenery called “Foro Italico”, admiring beautiful seafront buildings and the unique view over the coast of Palermo. We’ll end up this tour with a taste of our unique traditional street food (arancini, panelle, milza, etc.) in one of our favourite typical open air “street restaurant” and then we’ll return the bikes at our drop-off point at Discesa dei Giudici. Number of participants: Min 2- Max 15, for more people please contact us. Dress code: it is recommended to wear sneakers.